I could call it New Release, Part 2. Or The Case of the Disappearing Thriller. Or I could say that romantic suspense novel AWAKENING MACBETH, is FINALLY alive and well and available for your Kindle on Amazon. Initially published on 9 December, the ebook file became corrupted shortly after release. Not once, but twice. The corruption apparently stemmed from a merger of different file formats. You see, I wrote AWAKENING MACBETH several years ago (initially entitled MY SOUL TO KEEP) but decided to publish the Detective Emilia Cruz series first. This was easily 2 computers ago and too many upgrades of Microsoft Word to count. Smudge sticks, incantations, and various editing dramas happily resulted in a ready-to-read Kindle ebook which you can find here. Several readers who purchased the book earlier this month reached out to tell me of the corrupted file. Most were able to return the book for a full refund. I have gifted each a new copy. If you purchased a corrupted copy any time between 9-19 December, I’m happy to send you a free replacement. 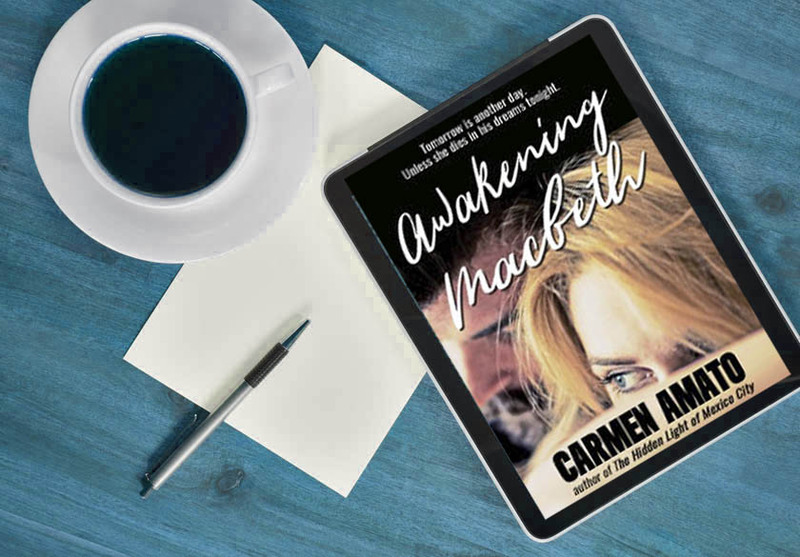 Email me at carmen@carmenamato.net with MACBETH Release in the subject line and I’ll reply with an Advance Reading Copy (ARC) in .mobi file format. You can use the Send to Kindle app from Amazon to send it to your Kindle device. It goes without saying that if you receive a free ARC, a review on Amazon would be very much appreciated. 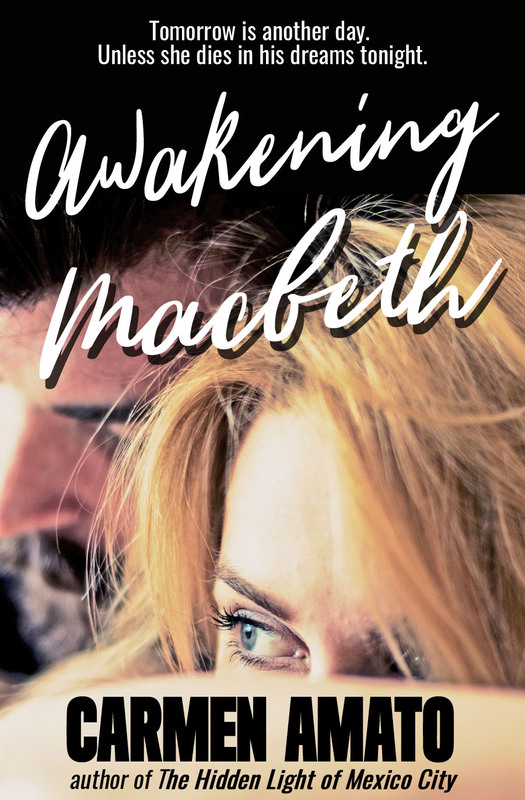 The design for the cover of AWAKENING MACBETH got an upgrade, too. Who knew one romantic suspense novel would need 4 cover tries before the vibe of the book was truly captured? I hope you like the final design! Tomorrow is another day. Unless she dies in his dreams tonight. Romantic suspense with a paranormal twist, AWAKENING MACBETH is a passionate tale of love versus evil. From Virginia’s most famous university to the Scottish highlands to a dusty road in Iraq, not even Shakespeare could have predicted the secret that will keep you up tonight. When Brodie Macbeth meets Joe Birnam, he hardly seems like the man of her dreams. Brodie is a University of Virginia professor and best-selling author; Joe is a Marine veteran who lost a leg in Iraq. Brodie’s last boyfriend was a famous television commentator; Joe is a carpenter who doesn’t even own a suit. Differences aside, the timing couldn’t be worse. Brodie is shattered by her father’s suicide and the strange will that requires her to read his collection of British history books and use the license plates from his car before she can inherit a fortune. No doubt that’s why she’s having terrifying nightmares. Every night in her sleep, a stalker with corroded eyes will kill her unless Brodie reveals her father’s secret. Of course, there is no secret . . . Falling in love with Joe Birnam helps Brodie heal. Slow to spark, the attraction between them becomes more than just a steamy romance. Joe is a strong man who has seen combat and knows what it means to lose someone important. He has his own demons to deal with, but Joe won’t accept anything less than Brodie’s full commitment. But once she gives her heart, Brodie discovers the stunning truth about her nightmares. They’re a real and deadly game. The prize is Joe Birnam’s immortal soul. But Brodie doesn’t know how to play, let alone win . . .